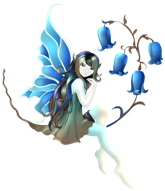 Being the typical Sanguine with an acute case of what is called "Peter-Pan-Syndrome", I will always have a special love for (or shall I say believe in) fairies. That was the easy part when it came to choosing a name and theme for our new business venture - it simply had to have something to do with fairies. Thinking of a flower blooming in spring, reminds me so much of how a person starts blooming when first learning the secret of floating across the dance floor with confidence. And the way a small child's face will light up, realizing he/she is the prettiest or most handsome kid at the party. Priceless. According to folklore, the fairies were called when the bluebell was rung and the ringing of bluebells, heard by a fairy, will cause her to wander off and dance in the light of a full moon. What's more: The bluebell represents humility, delicacy, and constancy. What more could we ask for? And from here our fairy is the "Belle of the Ball"!! !